How can we create sustainable and livable cities in the face of climate change? 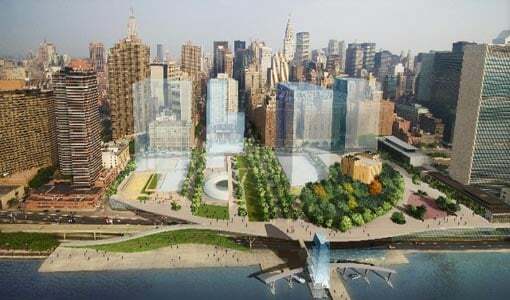 On April 8, 2014, the AIA New York Chapter is joining forces with the Consulate General of Denmark in New York to host a panel discussion on the water-related challenges faced by New York City and Copenhagen, and the wide array of approaches and solutions that have already been deployed or will be implemented. As part of Copenhagen Solutions, on view through April 16, 2014, the Center for Architecture will host a panel discussion exploring how the integration of urban planning, infrastructure, and new technologies are redefining how cities cope with climate change, and how they improve conditions of human life. Like New York City, Denmark’s capital city of Copenhagen also lies on the waterfront and it, too, has experienced the last decade’s devastation of torrential downpours and rising sea levels. The approach taken in Copenhagen has championed holistic, integrated solutions, and extensive public-private collaboration, making the city a global leader in fighting climate change while improving recreational infrastructure for its citizens. Is there something that we New Yorkers can learn from the Danes? What solutions and technologies are emerging? What is required to increase the resiliency of existing water infrastructure? What prospect does integrated water resource management hold?